Sometimes you need a quick way to get something off your iPhone or iPad, whether it be a screenshot, a Web page, or even an e-mail message. Sure, if you’ve got an AirPrint-capable printer you could print it, but then you’ve got an extra piece of paper to deal with. Fortunately, this is where Ecamm Network’s Printopia comes to the rescue and the new version 2.0 adds a handful of features to make this utility even more powerful. 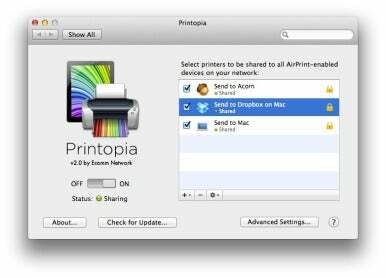 Printopia fills the gaps left by Apple in the AirPrint functionality introduced in iOS 4.2. The preference pane obviates the need for specific models of printers, instead letting you share any printer on your Mac with your iOS devices, or letting you send a file directly to your Mac, no printer needed. With version 2.0, Printopia significantly expands its capabilities. You can now print to specific applications on your Mac, including browsers like Safari and Google Chrome, or image editors like Acorn. You can also create an unlimited number of “virtual printers”—folders on your Mac where you can choose to send files (for example, you could have one for travel confirmations, one for financial statements, and so on). Plus, you can even add a workflow for the file you’re sending, having it automatically uploaded to a service like Cloud, saved to your Web Receipts folder, added to iTunes, or more. In the latest update, Ecamm also takes care of one shortcoming in the first verison of Printopia by adding the ability to password protect any of your printers, real or virtual. Speaking as someone who once returned to his hotel room to find that his MacBook now contained dozens of pictures that some industrious fellow had clearly snapped with his iPhone and then “printed” to my virtual printer, it’s a welcome addition. Printopia 2.0 is a free update for existing owners; a new license will cost you $20. It requires Mac OS X 10.5.8 or later and a mobile device running iOS 4.2 or later. A free, full featured 7-day demo is also available.